My shipla guru Ganapati V. Sthapati has a dream to convert his Vaastu Vedic Research Foundation at Vadakadampadi village, near Mamallapuram, into Viswa Karma University . Please read below the article form The Hindu newspaper of August 19, 2011. 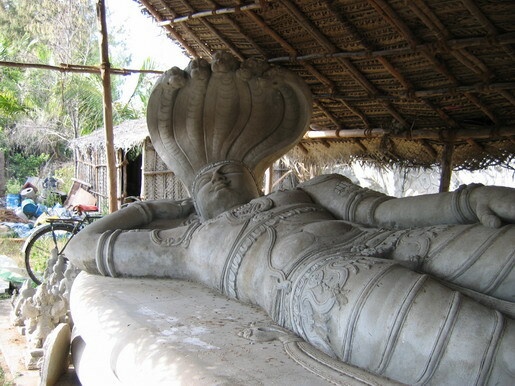 The Lord Ranganatha or reclining Lord Vishnu on Sesa Naga. EXTRAORDINARY: Dr. V. Ganapati Sthapati. Profile V. Ganapati Sthapati wants to turn his Vaastu Vedic Research Foundation into a University. “Eighty-four year old V. Ganapati Sthapati, renowned architect and sculptor, has a dream: to convert his Vaastu Vedic Research Foundation at Vadakadampadi village, near Mamallapuram, into a University. “If Chief Minister Jayalalithaa sets her heart on it, it can become a reality,” he says. “I want to make it a Viswa Karma University. Not only the four Vedas and the Pranava Veda composed in Tamil but temple architecture, housing architecture, town planning, sculpture, painting and the art of making bronzes will be taught there. It will be a regular college,” he explains. The art of making stucco figurines and terracotta idols will be included in the curriculum. He already has four acres at Vadakadampadi and he is sure that if the Jayalalithaa Government can provide 10 more acres nearby, the Viswa Karma University will take shape. Ganapati Sthapati's range of accomplishments is extraordinary. He has designed and built more than 600 temples in India and the U.S., the U.K., Australia, Singapore, Malaysia, Fiji, Sri Lanka and Kenya. He was the architect of Swaminatha Swami Murugan temple, popularly called Malai Mandir, situated on a hillock at Ramakrishnapuram, New Delhi. 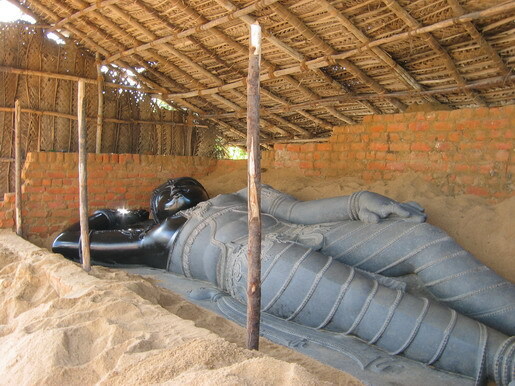 He was the architect of the Kannagi Kottam, built in stone at Poompuhar, near Thanjavur. Ganapati Sthapati also sculpted the superb images of Kannagi and Madhavi, two key characters in the Tamil epic ‘Silappadhikaram,' which are housed in the art gallery at Poompuhar. He built the Valluvar Kottam, the huge temple car in stone there and sculpted the statue of Tiruvalluvar in the posture of a moral preceptor, in Chennai. His magnum opus is the 133-foot tall granite statue of Tiruvalluvar, built on a rocky knoll in the middle of the sea off Kanyakumari. The driving force behind both the Valluvar Kottam and the colossal Tiruvalluvar statue was M. Karunanidhi, former Chief Minister. 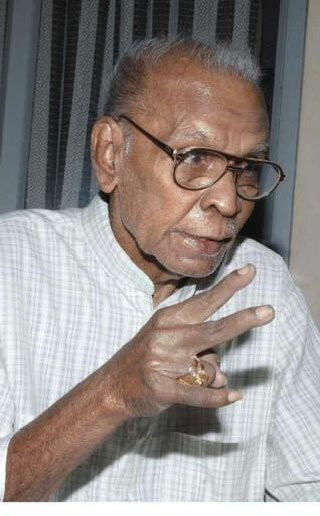 The late Chief Minister M.G. Ramachandran used Ganapati's expertise to design the administrative block and the library building, with ornamental entrance arches, at the Tamil University, Thanjavur. MGR encouraged him to sculpt a beautiful, 38-foot stone Buddha at Saranath, for the Dei Jokyo Buddhist Association, Japan. From 1961 to 1988, the Sthapati was the Principal of the Government College of Architecture and Sculpture at Mamallapuram. He has big plans for the Viswa Karma University, when it materialises. He calls his community, “Viswa Brahmins,” and says, “our profession is Viswa karma.” He has already built a Mayan (the progenitor of Vaastu science, that is, the science of architecture) Kudil at Vadakadampadi and a Mayan Memorial is coming up there. He asserts that the controversy over which language is older - Sanskrit or Tamil - is needless. He calls Sanskrit “the classical language of sculptors.” He will build a Veda Mandapam in the University to teach not only the Rig, Yajur, Sama and Atharva Vedas but also the Pranava Veda in Tamil. He estimates that the Pranava Veda is older than the other four Vedas. Ganapati Sthapati has already recorded on audio-tape the 50,000 stanzas of the Prananva Veda. He is keen that the Tamil Nadu Government should publish it and spread it. Ganapati Sthapati is an admirer of his father, the late M. Vaidyanatha Sthapati, the architect of the Gandhi Mandapam at Chennai, the gopuram of the Karpaga Vinayagar temple at Pillayarpatti, Tamil Nadu, the Ramana Maharshi mandapam, Tiruvannamalai, including the Bhagavan's statue there. 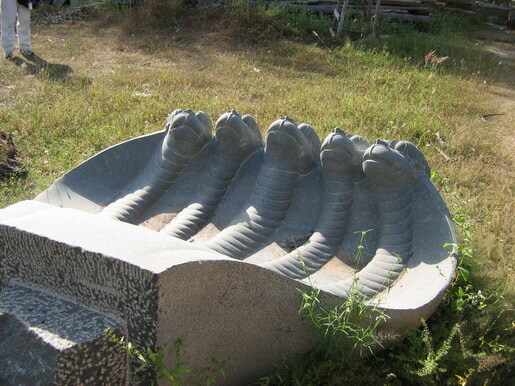 On Vaidyanatha Sthapati's suggestion, the then Chief Minister C. Rajagopalachari approved the setting up of a centre to train students in architecture and sculpture at Mamallapuram, which metamorphosed into a diploma and later degree-awarding Government College of Architecture and Sculpture.